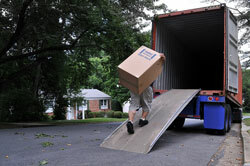 If you’re looking for movers in Atlanta who will take care of the entire job for you, turn to Bulldog Movers. Other movers around town can help you move, but might shy away from transporting all of your possessions, specifically the heavier ones. Or, other local movers may lift your heavy items for you, but then nickel and dime you for it because it wasn’t included in your original quote. At Bulldog, we lift all types of heavy possessions, and will never tack on any unforeseen or hidden fees when the move is completed. If you’d prefer to hold your heavier items in a storage facility during your move until you are ready for them, Bulldog is here to help as well. We offer competitively priced storage in a 40,000-square-foot facility that is dry, clean, secure, and climate controlled. We can even custom build wooden crates to ensure the protection of your most fragile possessions. So, the next time you need to have all of your possessions, especially the heavy ones, moved or stored, count on Bulldog Movers. Call or e-mail Bulldog today to find out more about our Atlanta movers and how we can provide you with a smooth and successful move.